Two hours was spent this evening updating Encounters Keep on the Borderlands characters to 2nd level with the new Online Character Builder on its highly anticipated release date. The speculation on its capabilities, its limitations, and its very ethical implications have been raging across the internet for many weeks. Blogs, preview videos, message boards are alight with discussions about the New Online Character Builder. I cannot lie and say that I myself wasnt worried. Certain aspects of the software seemed daunting to me, but many of the worst rumors turned out to be patently false. 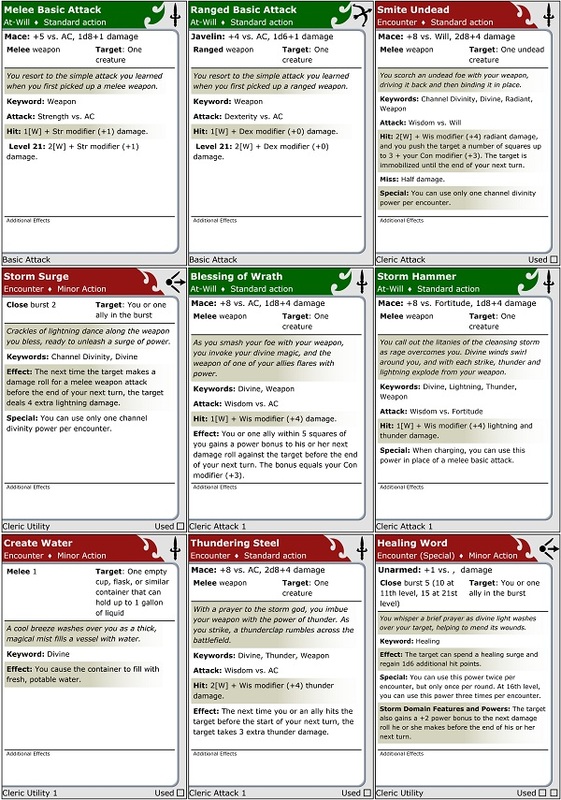 After a rough patch in the beginning, I flawlessly breezed through the character creation process of 6 characters for the Season of Serpents Campaign. Technically speaking, my machine was a perfect match, I use firefox and have an active Netflix account. No software needed to be downloaded and within a few seconds of hitting Launch! the character builder was going. The menu is clean and offers a nice introduction to the character creation process. The easy essentials option was a joy to use, and with only four or five choices, a well made character popped out. I only tested this option briefly however, since I wanted to match the pre-gens. These characters were all generated using the second option on the Online Character Builder, the custom option, and from there I chose Keep on the Borderlands campaign, which was actually pretty cool to see up there. I can imagine it changing from season to season, and really gives a feeling of continuity and connectedness to the game. For the publisher of DnD, a traditionally booksellers market, the transition to electronic media must be a painful one, and this software, like the offline version that came before, represents a step forward in the direction of online media. From the opening screen, the process is very much like the older version. The interface seems more focused, and did not seem to detract from the experience, unlike the older version. However, by choosing Keep on the Borderlands Campaign, it limited the choices, and none of the non-essential options were available. For starters this meant only essentials character classes were available, which was great. I hope that after this season ends, that button sticks around, so we are able to create essentials only characters without having to go the quick route. There were a few bugs. I had to restart more than once, and got plenty of “start over or recover?” questions, but they really did a good job of recovering up to the last point of entry. That must explain the few second pause after each input. Most of these errors occurred in the first half hour, and it may have been a particularly busy time on the webs, or some other cause. After that things evened out and for the next hour and a half, there were only one or two time-outs, all recovered successfully. I didnt get a chance to import a character, which is an area that has potential to cause trouble. 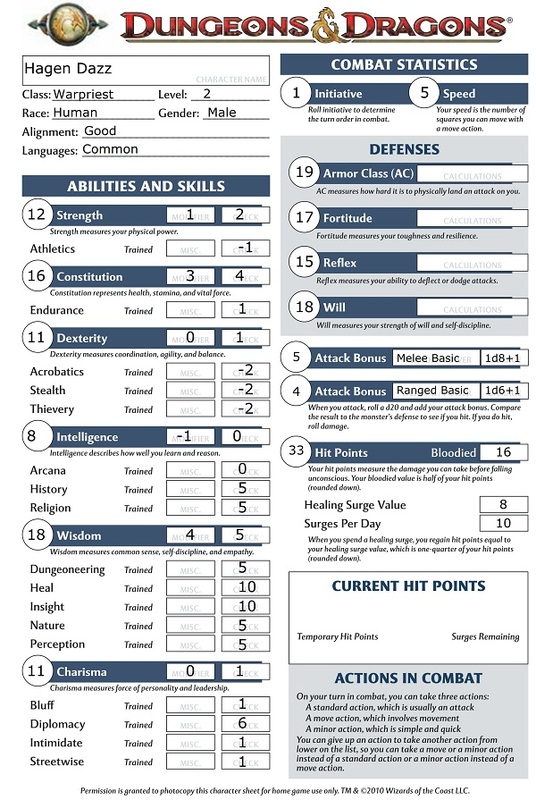 It was also disappointing not to se the Dragon Magazine playtest version of the Essentials Assassin in the new Online Character Builder. 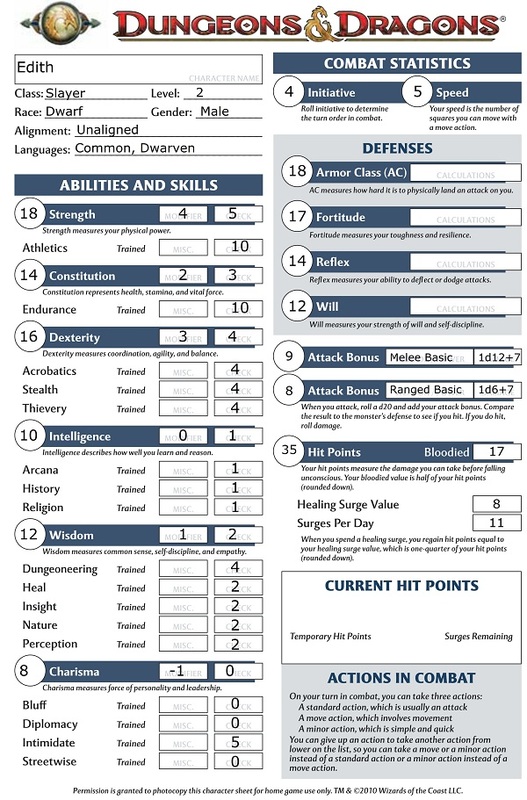 It is understandable that resources were better spent elsewhere in getting this product out the door, but plenty of other playtest character classes have graced the character builder of old, and darn it, I really wanted to make one. 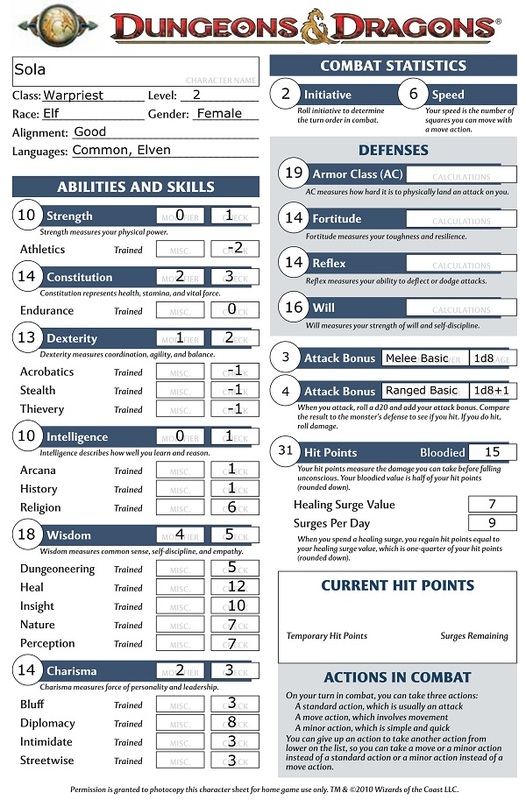 So, making essentials characters, even the long form version, is still fairly simple. I was allowed a few power choices, but not many, and a class act here or there. The feat tables were the most daunting section, especially since some of the pre-gens do not have their feat listed – for brevity, so they say. Luckily, by limiting the choice to Essentials from the beginning, the lists were much smaller then the 2,500 or so in the complete list. The feats page was also one where a distinct improvement could be seen over the old version. 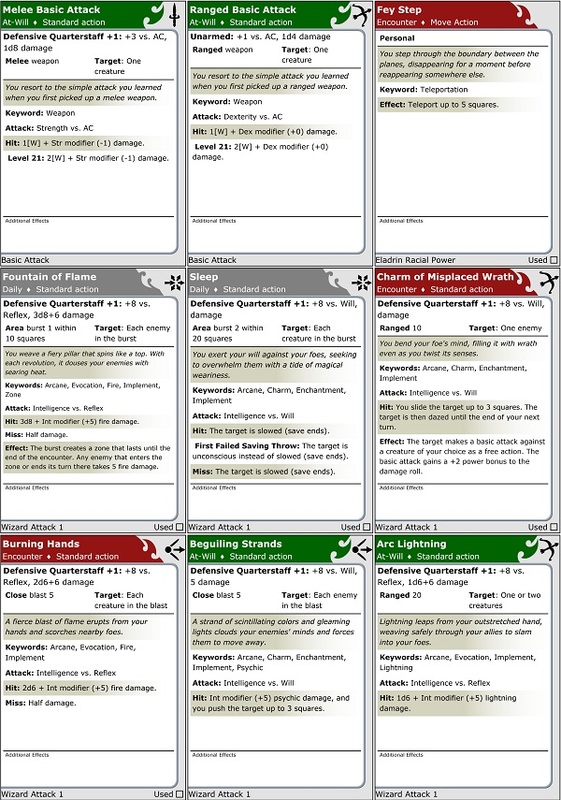 Here the feats were better arranged, and the paired down set, especially didnt seem overly daunting to use. Feats seem to be a necessary evil of this edition of the game. There are so many cool ones, and they truly allow more customization and sculpting of a particular character view than ever before – I give you Headsmans Chop as the perfect example – but the cost is high. To wade through the feat list on a standard character is to invite boredom, worry, grief, and finally a sort of dazed acceptance of the fact that no matter what your choice, there will have always been a better option out there somewhere. Thankfully, at least on the Essentials side, this feeling of a bottomless abyss is gone, or at least behind a smoked mirror. 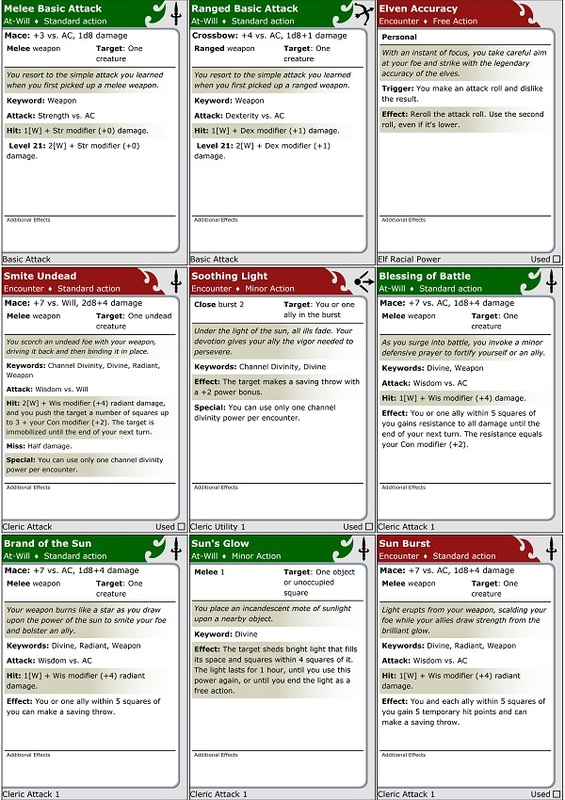 The rest of the character came together fairly easily, finishing up with buying and equipping items. Some of the characters in these files have magic items. These characters are from a locally played game of Essentials, played mostly by kids and teens who frequent the game store every Wednesday night. 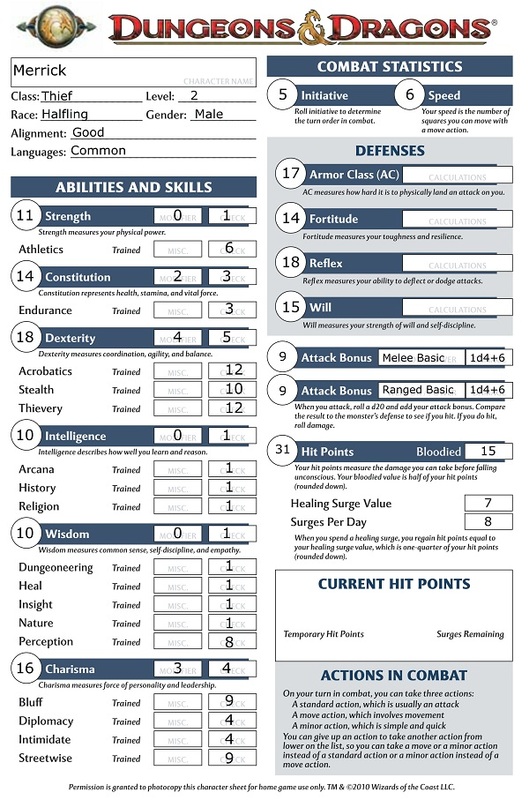 It would be ridiculous to think that they will all show up tomorrow with ready to go character sheets, and so I foresee many DMs finding themselves in similar straits – that of needing level 2 character sheets in a pinch. 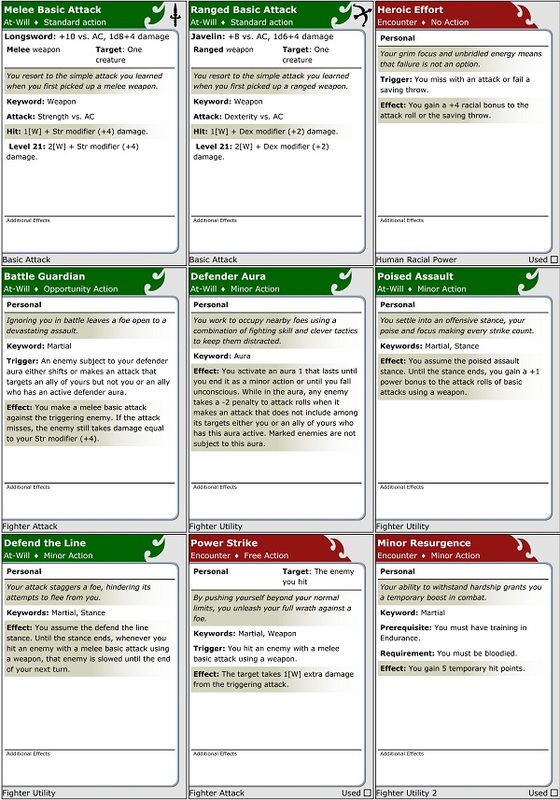 Besides these sheets, another worthy source are the pre-gens from Red Box Gameday, featuring my favorite character of all time, Thia the elf rogue. Once the characters were done, I printed them to Cute PDF which is a free program that is a ghost printer that makes pdfs. It is great, and saves me ink sometimes. 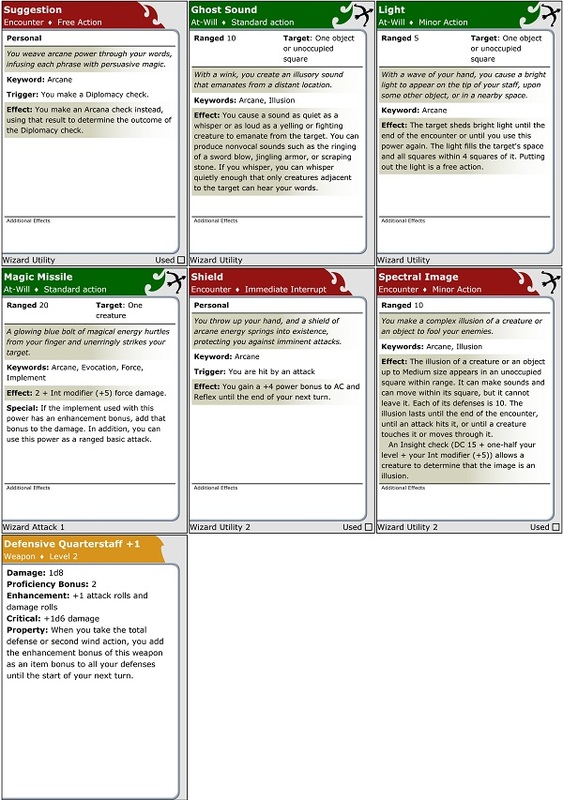 In this case, I box selected the first page and the powers from the essentials style character sheets, and then turned them into images, an voila. I hope that I am not stepping on any copyright toes, but my intentions are sound, that of bringing freedom to the people. 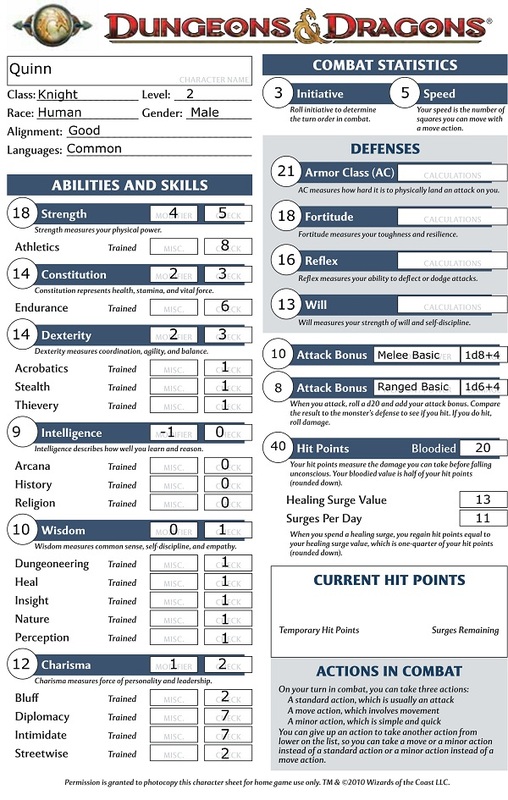 In my defense, as stated above, the sheets are for a personal game, the sheets are a much smaller size then the originals, and most important of all, they do not include page 2-3 of the actual character sheets, making them playable, but a player would still be missing out on a lot of the character, including descriptions of class skills and feats, as well as equipment the like. But back to the sheets themselves. The essentials sheets look very attractive, and showing one to my wife, she was ready to give up the old look for the new at first glance. The old sheets were dark ink-hogs, and all the lines made it difficult to read sometimes. 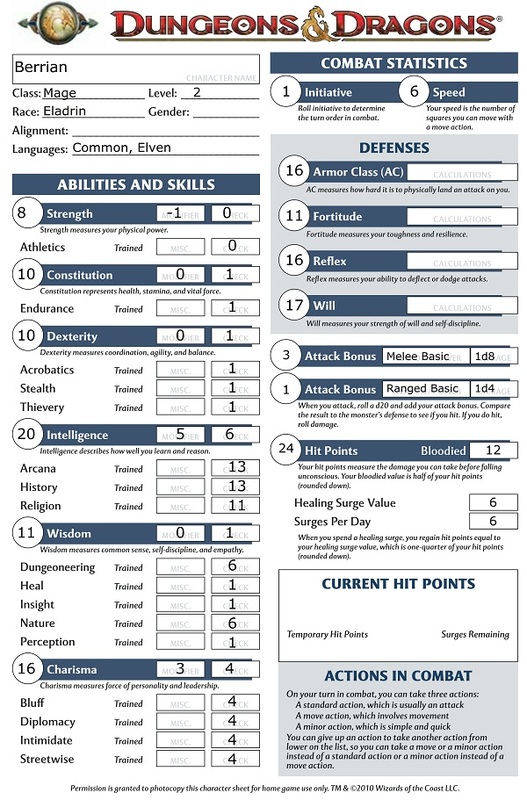 The essentials sheets contain plenty of white space, in fact the first page might go almost too far towards that Basic DnD look. Tastes may vary on the subject. The placement of skills under the attributes which they keyed off, was brilliant, and it looks like it was always meant to be there. The basic attack section is a little strange, with the to hit bonus circled like a major defense. I personally love the way the attributes take up almost a full half page, what with the skills and all. Looks good and old school. Pages 2 and 3 on the other hand, go a new direction and it shows. There is a weird lack of synergy between the “essential” old school look of the first page, and the slick look of the following set of pages. Another issue is the fact that these character sheets are just too many pages long. It seems like pages 2 and 3 might be consolidated, but maybe not. Also, since the Encounters pre-gens were only level 2, the second page was particularly sparse, and will be filled in with more racial, class, and other fun bonuses as the characters advance in level. Finally we come to the power cards. In a way, I was hoping for a brief synopsis like on the pre-gens themselves, but I knew in my heart this would be impossible. The cards are back, and a few PCs even had a couple pages worth. I have a love hate relationship with the cards – not against the powers, just the cards themselves, but I did notice one area of improvement. The important numbers, the plusses to hit and damage, are right up at the top, not hidden down below as before. 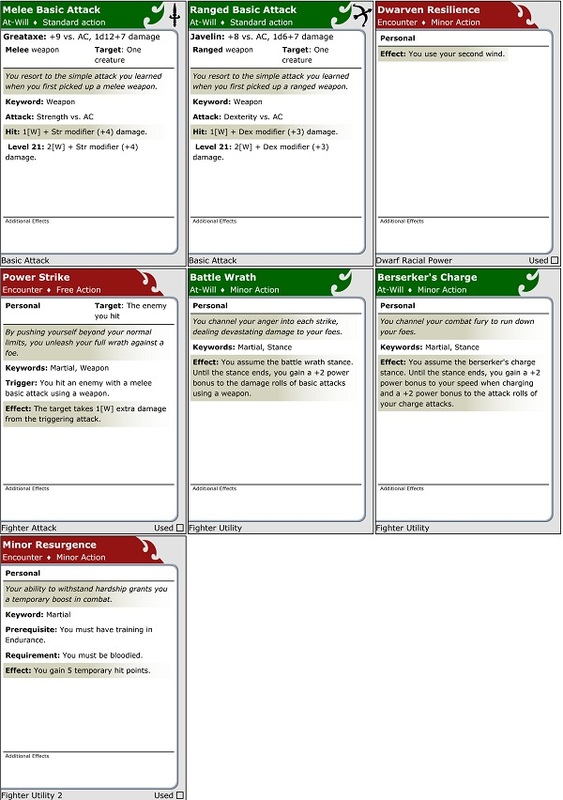 On the other hand, the character sheet itself is not able to be modified, so I couldnt hide some of the cards as I have in the past. In summary, I found the Online Character Builder to be a great piece of software still having some growing pains. 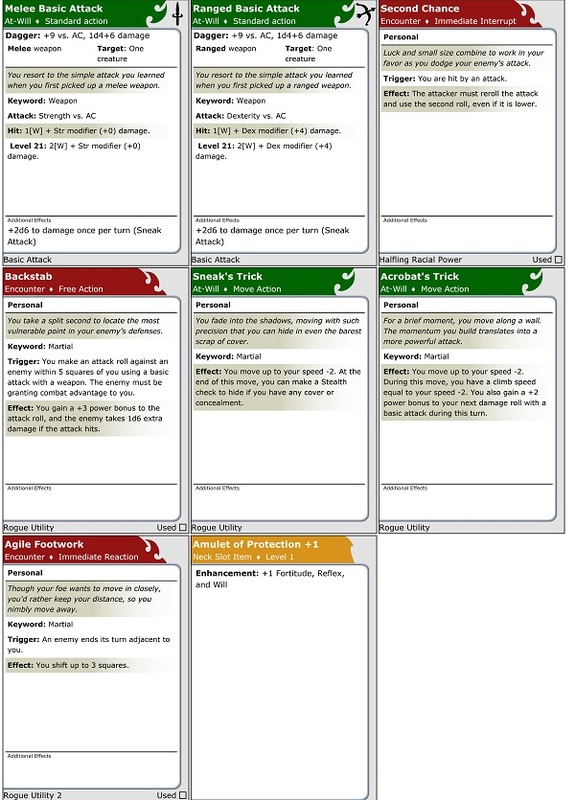 It has tall shoulders to stand on, since the Old Offline Character Builder was one of the pillars of the DnD 4e Game, and widely lauded as a great piece of work. This program on the other hand, is more modern, sleek, and up to date, but there are many bugs to be ironed out, and many, many, features left out that were in the old version. So my final verdict is that I am happily enjoying the new builder, but it is a real annoyance to have these limitations from the program I am used to running. As a DM, I have many duties, and for some of my players, maintaining their characters for them is one of them And as an Encounters DM, I dont know what the organizers were thinking we would do – hope that all the prospective players show up with shiny new characters from the Online Character Builder? While many will, the idea of not being prepared for the worst is laughable… to me. the import feature actually works pretty good. it did a lot of crashing, and that half second constant delay while it sends data back as auto save is a little annoying, but for “version 0.1” it’s pretty neat. I did notice that you seem to be missing feats. I had calculated out that most of the characters seem to have taken weapon feats to get to their original stats. for + at first level and with +1 for second level +8. Also missing 2nd level feats. Should also increase basic melee by +1. For Sola I tried to differentiate her from Hagen by making her even more healy and less melee – I gave her Combat Medic and Disciple of Light at the cost of some mace swinging goodness I am afraid. Also, I had limited time to devote to deciphering the hidden feats of the pre-gens, so I had to guess. The characters are all legal however. Score 1 for power cards.